Christopher Gene Yager (April 25th, 1979) was born and raised in Amsterdam N.Y. where he attended Amsterdam High School, graduating in 1997. Yager was a two sport standout athlete which he played for the Amsterdam Rams basketball and baseball teams. He was a three year starting pitcher and shortstop for the Rams baseball program from 1995-1997. Yager was moved up his sophomore season to the varsity level by Coach Brian Mee to give the team pitching depth, in which the team was in a three way tie for a chase of a Big 10 Conference Championship. In his debut Yager threw a 3 hitter with a 5-1 victory over Bishop Maginn to help the team to advance to the conference championship in which the Rams were victorious becoming the 1995 Big 10 Champions. He was named Rams Baseball captain for the 1996-1997 seasons. In his senior season Yager led the Amsterdam program to its first sectional win in 11 years then helping the team advance to the programs first section II Class A championship game in 23 years. He finished his high school career with 7-2 record with 2 saves in 69 1/3 innings and a phenomenal 1.19 ERA both of his losses were by 1 run and one being in the Section II championship game against Columbia losing 2-1. He also batted a modest .281 with 20 hits in the lead-off spot, but got on base enough to score 18 runs. He was named MVP of the 1997 Rams Baseball team and was selected to All Area Baseball 1st team in which he was runner up for Player Of The Year. After high school he choose Hudson Valley Community College pursuing a degree in mortuary science in hopes to work for his families funeral business and also play for the Hudson Valley Vikings Baseball program. In 1999 Yager was a part of the Vikings Baseball Team that was ranked 3rd in the Nation overall in which he led the team winning the NJCAA D3 Mountain Valley Conference Championship, he was also named All Region 2nd Team. In year 2000 he was named All Region 1st Team as a pitcher. He finished his college career with a record of 10-4 with 94 innings pitched and a 3.20 ERA, in which he also batted .350 in 102 At bats in 2 seasons. He graduated President's List with a Associates Degree in Mortuary Science. After numerous baseball scholarship offers few being NCAA D1. Instead he choose to start his career in the family funeral business and follow one of his childhood dreams of being a firefighter which in 2003 he was hired as a professional firefighter for the City Of Amsterdam. He went onto graduate from the New York State Fire Academy and then received a Paramedic degree from Hudson Valley Community College in 2005. He has been a professional firefighter for 16 years. Even though Yager choose a different path in life out of college, he has had opportunity traveling the entire country playing for teams from all over the states participating in amateur baseball championship series against many minor league professional players and ex big name MLB players in which he won numerous championships and championship rings in Cooperstown, Puerto Rico, Arizona and Florida. While in the Caribbean World Classic Championship in Puerto Rico Yager got offered to play professional baseball in South Whales Australia and Quebec Canada. 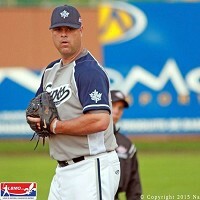 Yager decided on pursuing his childhood dream and went to Quebec Canada signing as a relief pitcher in the LBMQ (Ligue de baseball majeur du Quebec) of the CPBL (Canada Professional Baseball League) for the Sherbrooke Expos. In 3 seasons Yager had a record of 8-2 regular season 61 innings pitched with a 3.67 ERA and 3-0 in playoff series 15 innings pitched. He is currently still playing in the Albany Twilight League in which he threw a complete game no-hitter at age 37 two seasons ago. Yager went onto receive his coaching degree. He started his coaching career in 2005 when became an assistant varsity baseball coach at Guilderland High School under Head Coach Doug LaValley. Yager also coached under LaValley for the South Troy Dodgers Summer league and has been coaching at Guilderland for 14 years. Since he started coaching the program has been in the sectionals all 14 of his seasons with 2 Section II Class AA Championships and 1 Regional Championship advancing the program onto the final four in Binghampton ending the season as NYS Runner Up losing to Linderhurst L.I. in the NYS Championship Game. Yager is working towards retiring from the firehouse and pursing a coaching career as a head coach or assistant coach at a college level or professional level.